I wanted to create a sunset to place this stamp against. I used the stamps from Techniques Stamps Savannah Giraffes - www.techniquejunkies.com/savannah-giraffes-set-of-2/. 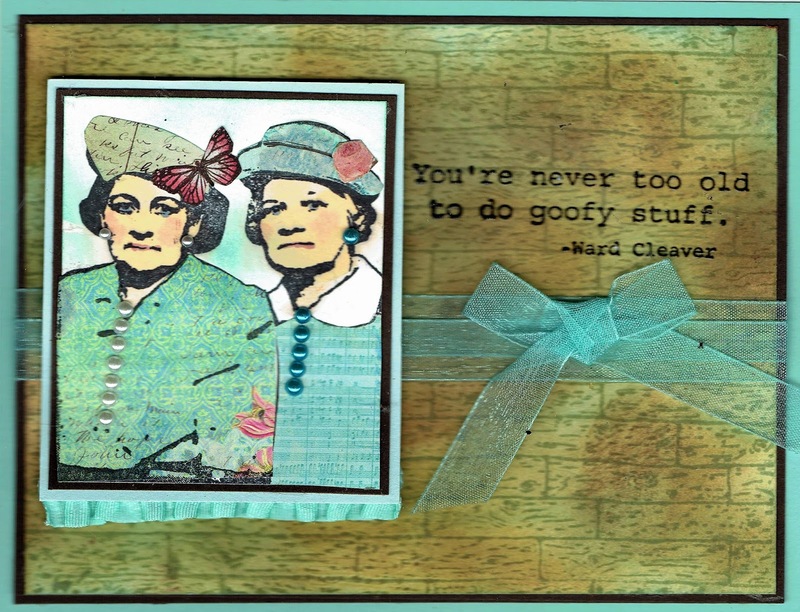 I used two Technique Junkies stamps for this card. Neither are August releases. The stamps I used are: Goofy Stuff - http://techniquejunkies.com/goofy-stuff/ , and Old Friends - . http://techniquejunkies.com/old-friends/ . 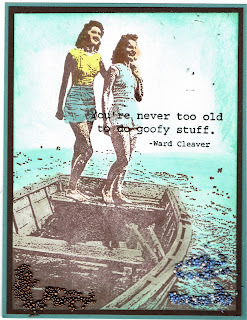 There is a verse that comes on the Old Friends stamps and it is a good one. But I cut it off years ago so the stamp would be more versatile. The scene is colored with my Copic markers and the sky is sponged. I added some coordinating Prills in the corners to add visual interest as the embellishment. This would make a wonderful birthday card! Have a terrific day and get inky. And an August release Planks - www.techniquejunkies.com/planks/ . 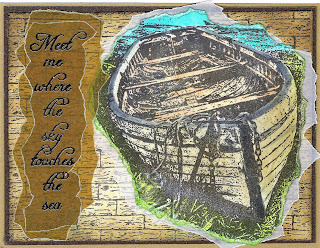 The fishing boat was colored with my Copic markers, and the torn cardstock of the boat was spnged with green and then layered on white vellum as a layer behind it. The planks were sponged over with color from several brown Distress Inks. The verse was stamped and heat embossed on brown vellum and the vellum was torn and double layered. The vellum was adhered with one of my Xyron machines. - to add the color. 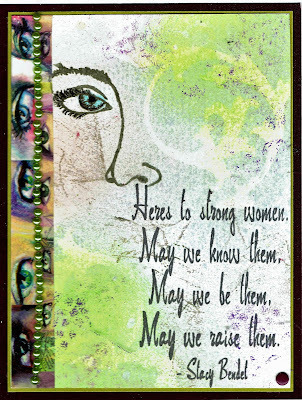 I tore the image and sponged color around the edges to match the card stock for the base card. 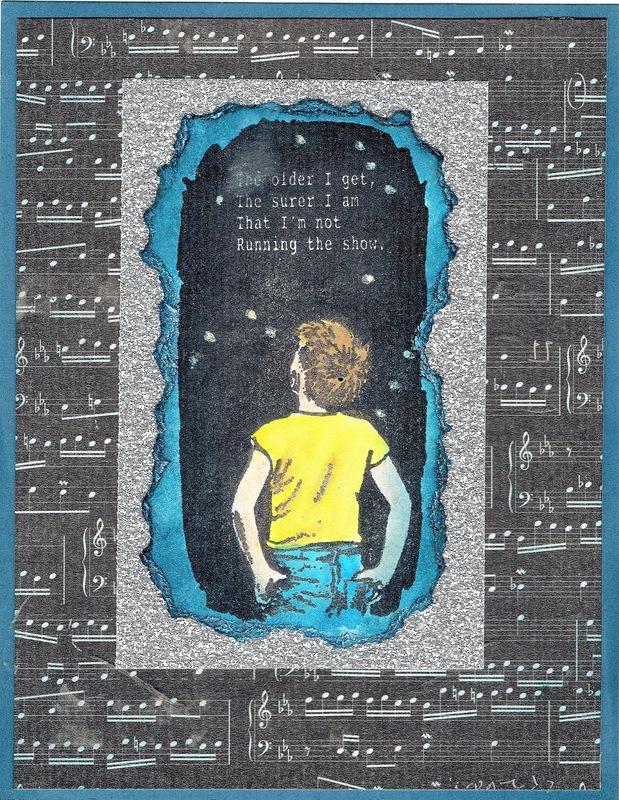 I framed the focal image with silver glitter paper, and layered that on music themed background paper. I added some shimmer to the night time sky with my Wink of Stella pen. 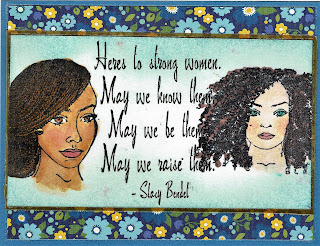 www.techniquejunkies.com/strong-women/ . I also used two lovely faces from the Technique Junkies set called Beautiful Faces - http://techniquejunkies.com/beautiful-faces/ . The faces are colored in with Copic markers. The verse is heat embossed with Versafine black ink and clear embossing powder. I sponged in the background. The flowery paper is background paper. http://techniquejunkies.com/goofy-stuff/ . I colored the planks in the a sponge and Distress Inks. I colored the Hat Ladies's faces with my Copic markers and used paper piecing for their dresses and hats. I hope you have a wonderful day -- and get inky! Veined Marble - http://techniquejunkies.com/veined-marble/ . 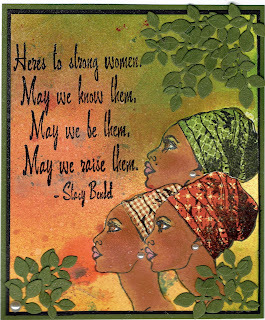 Washi tape and self adhesive pearls embellish the left side of the card. I sponged color here and there, and added highlights of color using Wasted and Veined Marble. I used Copic Markers to color the few facial features. And don't forget to use this code when you order -- TJ10Judy which will get you a 10% discount on everything you buy now. And have you joined our Facebook group yet? Please do! This is a neat stamp from the TJ August release calling Running the Show - www.techniquejunkies.com/running-the-show/. I used a star embossing folder and silver glitter paper as a layer here and there. I used my Copic markers to color the image and my Wink of Stella pen to highlight the stars in the image. This is a fun card to use as a birthday card, thinking of you, or a thank you card. Don't forget if you use the code TJ10Judy you will get 10% off your purchases. And have you joined the Technique Junkie Facebook group? Please do. www.techniquejunkies.com/rainforest/ - with Twinkling H2Os. I used my MISTI so I could over stamp sections of the image to add back in the lines as some of the H2Os can be relatively opaque. I heat embossed a verse from Mae West Sentiments - http://techniquejunkies.com/mae-west-sentiments-2-set-of-5/ on vellum and then doubled the vellum so you could sort of see the image beneath and yet it allowed the verse to stand out. I adhered the vellum with my Xyron machine. My card here uses parts of several Technique Junkies stamps. 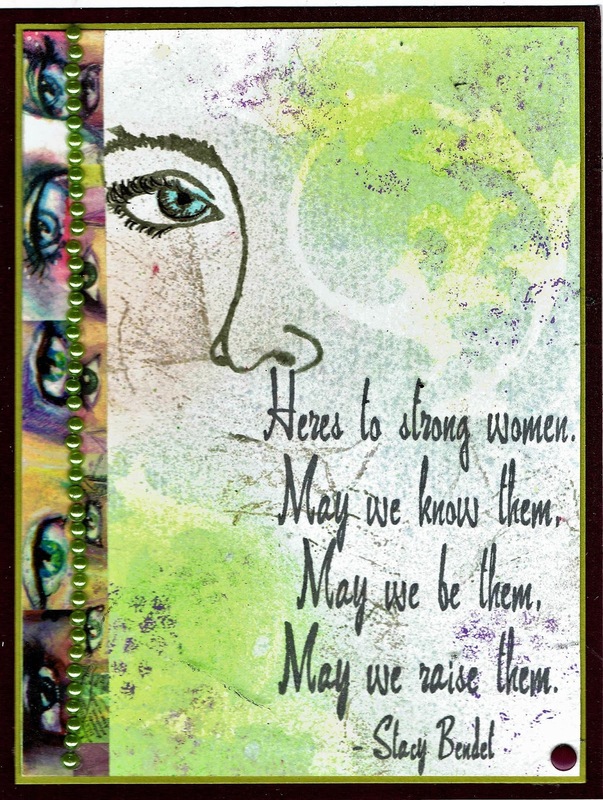 The August release stamp on this card is Strong Women - www.techniquejunkies.com/strong-women/ . I used Copic markers, sponging, Nuvo Glitter Markers, and Smooch paints. http://techniquejunkies.com/dragonfly-collage/ ; Key Script - http://techniquejunkies.com/key-script/ ; and Weed or Wish - http://techniquejunkies.com/weed-or-wish/ . 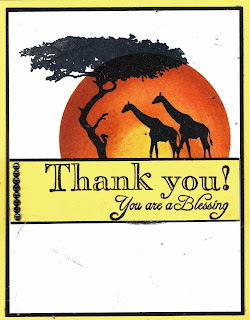 To create this card, I used a die cut to cut a large circle from a sticky all over note pad. I placed the outside of the circle and sponged the inside of he circle. I used a long post-it-note and covered up the bottom section of the circle. 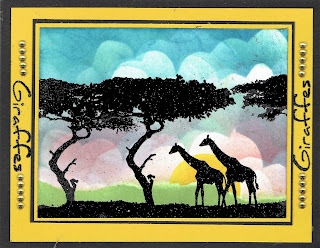 Then I heat embossed the giraffes and the tree. 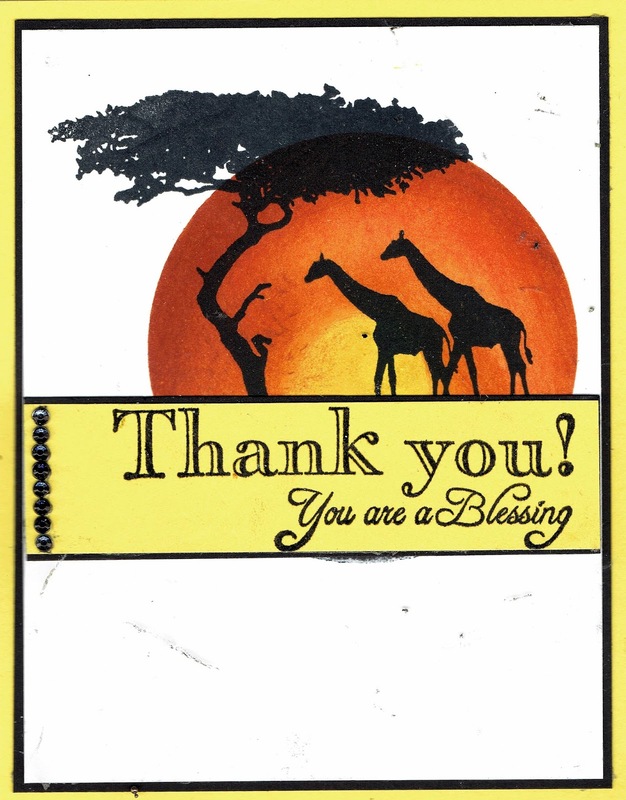 www.techniquejunkies.com/savannah-giraffes-set-of-2/ ; and one of the greetings from Grand Greetings - http://techniquejunkies.com/grand-greetings-set-of-5/ . 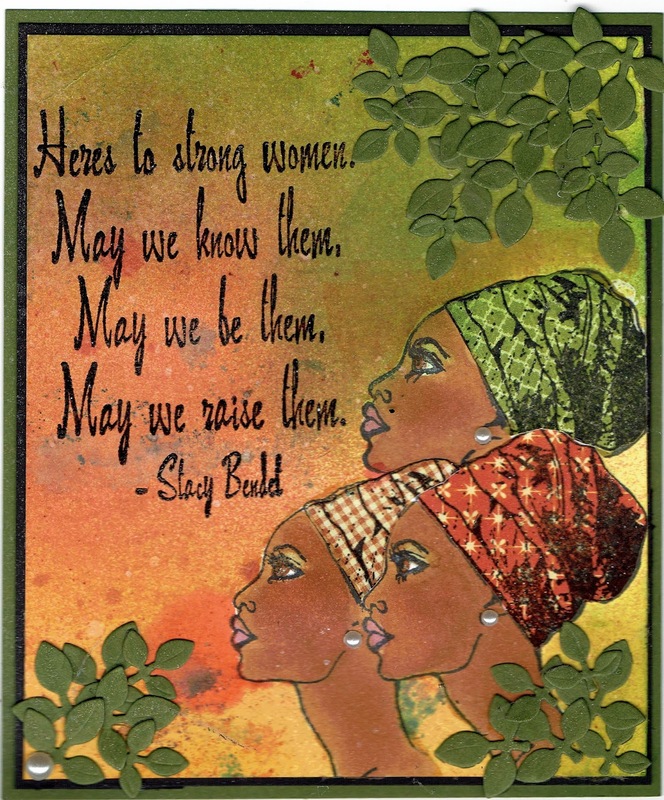 This is a wonderful set of greetings for several occasions. 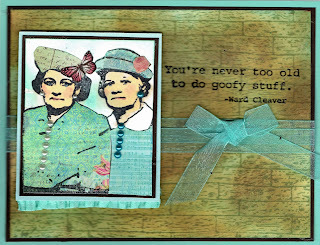 This was a fairly easy card to create. I hope you will try something similar. 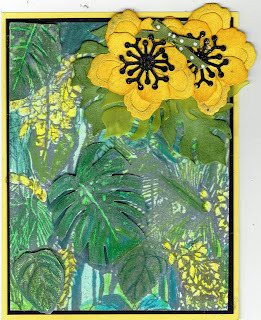 I used this beautiful Technique Junkies stamp called Rain Forest - www.techniquejunkies.com/rainforest/ for this card. 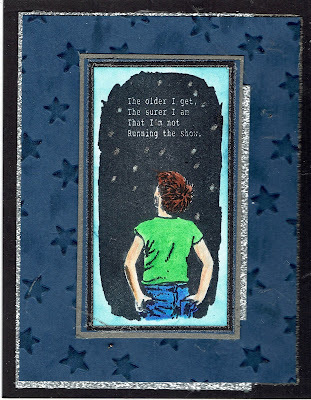 I used markers and colored the stamp die -- (direct to stamp) and huffed on the stamp to re- moisten the ink. I used a MISTI to press the stamp to the paper, so that as more color and ink was needed I could add the color and be sure of the placement. I used the thin end of of a darker marker and added details to leaves. 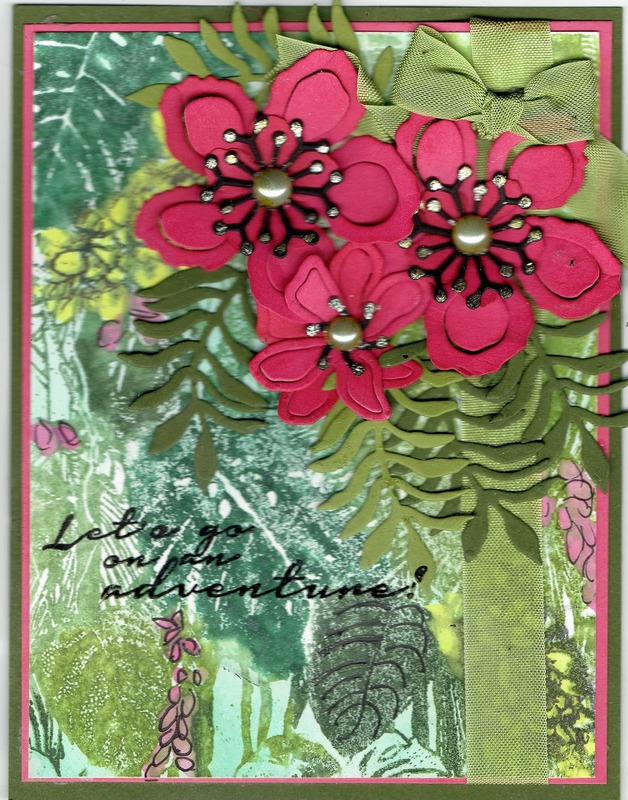 I used flower and leaves die cuts to add interest and texture. I used Nuvo Glitter markers to add some sparkle to the ends of the flower stamens. I stamped a verse from the Technique Junkies set Road Trip - http://techniquejunkies.com/road-trip-set-of-6/ . The verse was heat embossed. Hooray For August Stamps! A Wonderful Blog Release! Hooray, hooray! Today is the Technique Junkies Stamps August Release Day. 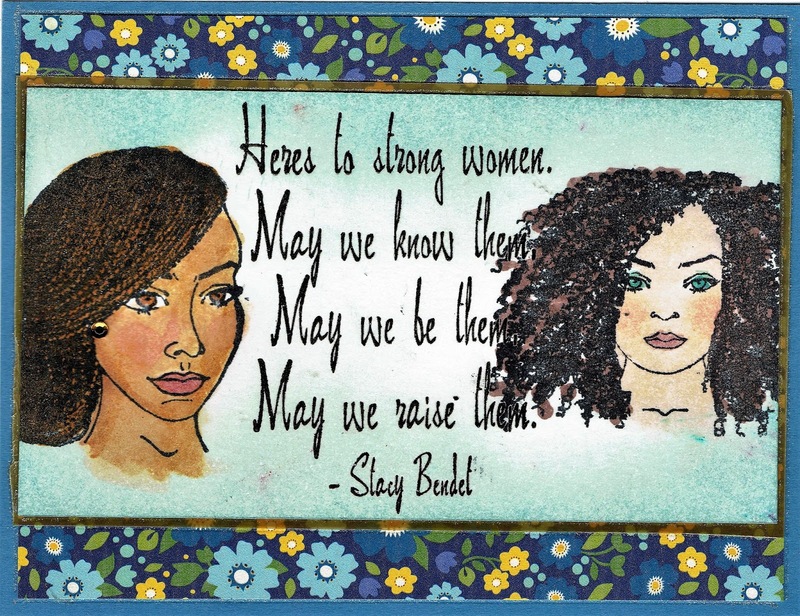 And we have blog hop for you! I am excited and I hope you are as well. You should start your delightful hopping at this blog - https://techniquejunkies.blogspot.com/2017/08/technique-junkies-august-release-blog.html. 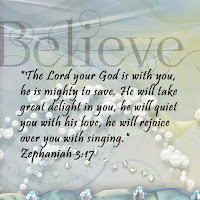 The rest of the the blog hop links will be at the end of my post. You will not want to miss any of the posts from the Design Team posts. They are wonderful. And if you want to see all of the new stamps in this release in one place - please go here - www.techniquejunkies.com/august-2017/. 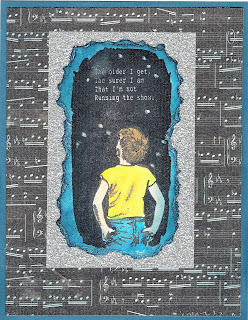 And as is usual, Pat Huntoon is offering 15% the Technique Junkies Stamps August releases, so be sure and go shopping. 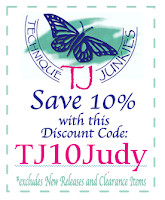 And anything else in the Technique Junkies web store will be 10% off if you use this code -- TJ10Judy. http://techniquejunkies.com/beautiful-faces/ . I also used the Paper Piecing technique for the headdresses of the women and placed the headdress on each woman as I stamped the image. . I stamped the same face three times on "post it notes" that have sticky stuff all over the back of the paper. I stamped the middle face first, covered it with the "mask," and then stamped the lower face image. I covered it with a mask and stamped the third woman. Then I covered it with a mask. 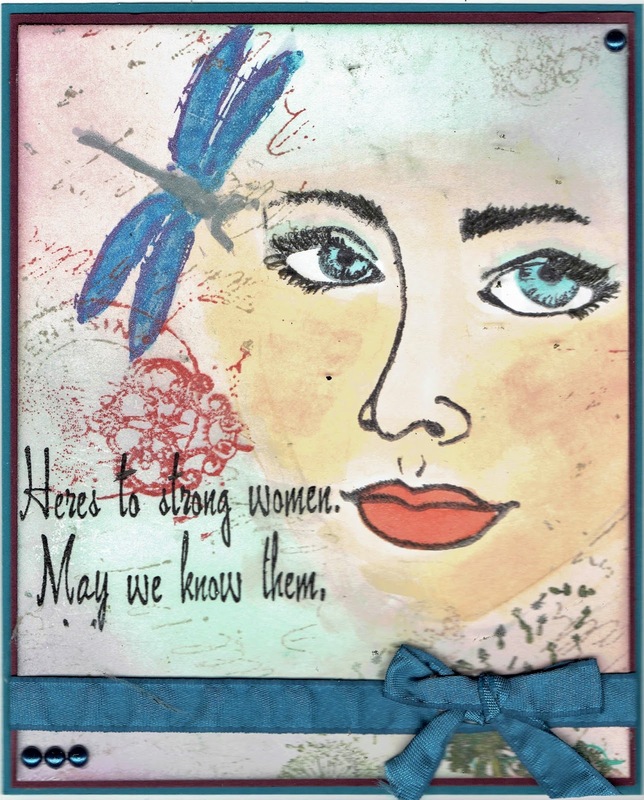 After all of the women's faces were covered with a mask, I then used Art Anthology Colorations spray to color the background - http://techniquejunkies.com/products-and-accessories/art-anthology-products/. I added some die cut leaves in three corners. 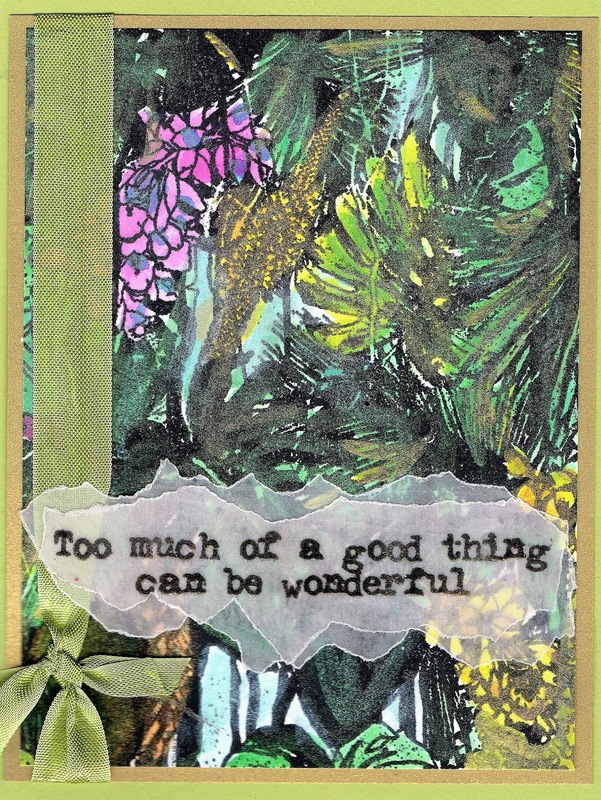 I created this card with some layering of die cuts and die cuts of grass. I used Technique Junkies August release of Savannah Giraffes - www.techniquejunkies.com/savannah-giraffes-set-of-2/ ; and an older TJ stamp called Mama and Baby - http://techniquejunkies.com/mama-and-baby/ . I stamped and heat embossed the giraffes and tree, and created the sky with sponging. 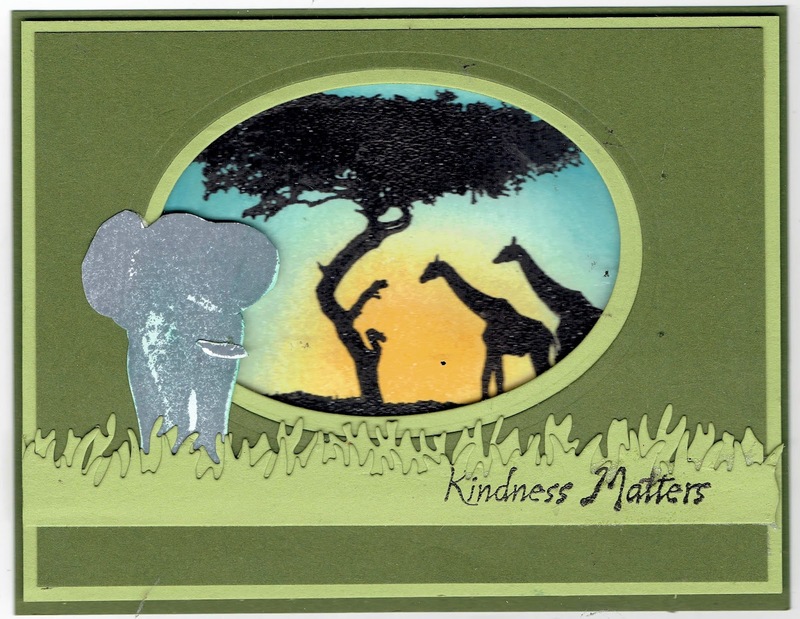 I fussy cut the baby elephant and adhered it to the top frame. I used the verse Kindness Matters - http://techniquejunkies.com/kindness-matters/ - on the grass. The two top layers are popped up with foam tape. 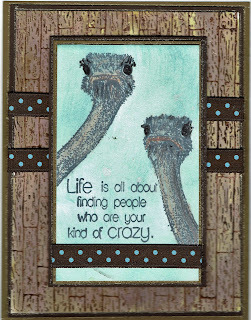 Ostriches are funny creatures. They are classified as birds because they have feathers but cannot fly. Their bodies just not have an aerodynamic shape for flying. 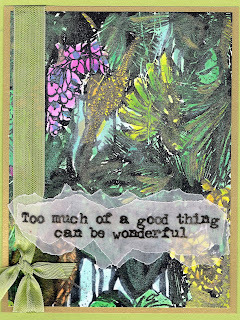 Both stamps used here from the Technique Junkies August Release - Your Kind of Crazy -www.techniquejunkies.com/your-kind-of-crazy/ ; and Planks - www.techniquejunkies.com/your-kind-of-crazy/ . 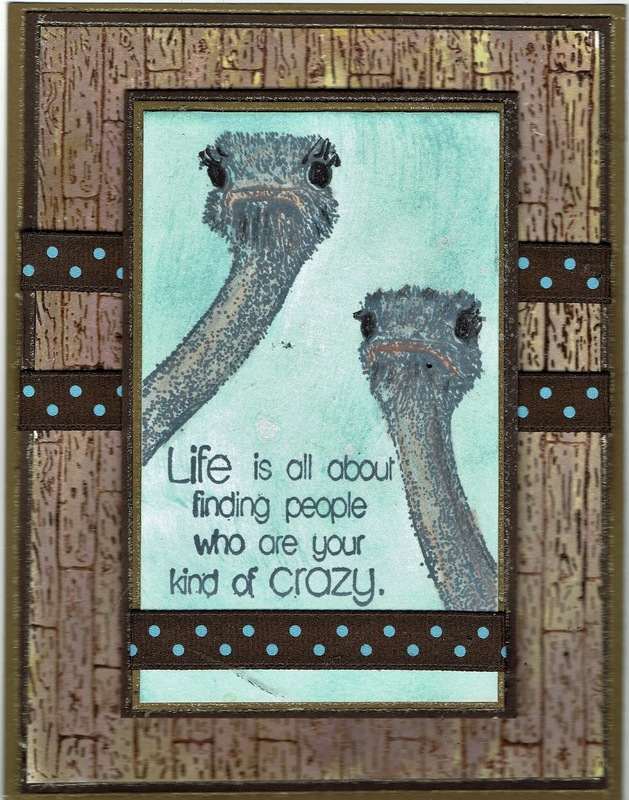 I used Copic markers to color the ostriches. The planks were heat embossed and then painted with Twinkling H2Os. 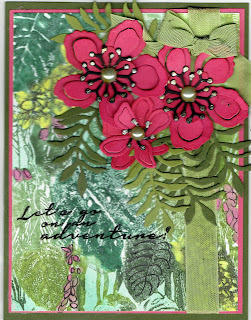 My last card uses the Technique Junkies stamp Rainforest - www.techniquejunkies.com/rainforest/. to color in the rainforest leaves and such. I stamped the image twice and colored and fussy cut some of the leaves and popped them up using some foam tape. I also die cut some flowers and additional leaves. I sponged color on both the flowers and the leaves to add additional dimension to both. 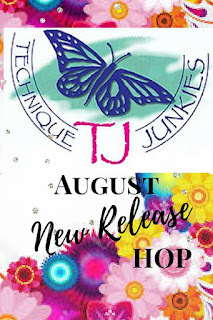 So there are my offerings for the Technique Junkies August Blog Hop and I hope I have given you eye candy you have liked. Remember all of the Technique Junkies August Release stamps are on sale 15% off through August 8. And everything else in the Technique Junkies web store will be 10% off if you use this code -- TJ10Judy. Don't forget all of these new releases are on sale 15% off through August 8. And everything else can be 10% off using the code TJ10Judy! Have a great day - and get inky!